MiniDV to DVD transfer. 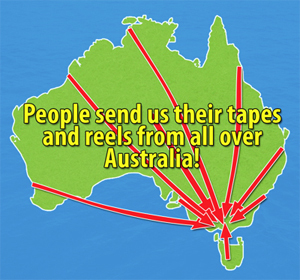 Melbourne, Canberra, Perth, Sydney, Brisbane, Hobart, Darwin, Adelaide & the rest of Australia. Convert your MiniDV to DVD disc, file or hard drive today! MiniDV was released in 1995 and quickly became the standard for home and semi-professional use. And even though the tape is the smallest of the various camcorder tapes available, it is the highest quality. So whether you have a trip to Disneyland or a previously unseen avant garde short film shot on MiniDV, we will be able to put that on DVD for you no problem. If you would like to know how much it costs to have your MiniDV tapes transferred to DVD disc, please ring PhotoQ on 03 9855 0006 to get a quote. We don't just transfer MiniDV tapes. We can also transfer your old 8mm, 9.5mm, 16mm reels to DVD disk, file or hard drive and Slides, negatives and prints to CD!